(Nanowerk News) A novel “Best Practice Guide for the Safe Handling and Use of Nanoparticles in Packaging Industries” is now available to support those working with nanomaterials at all stages in the development of packaging products. The Best Practice Guide is the final output of NanoSafePack, a 36 month project funded under the European Union’s Seventh Framework Programme (FP7). The development of the guide was informed by novel research activities undertaken as part of this project, as well as wider state-of-the-art knowledge in the field of nanosafety. Primarily intended for use by SMEs and larger companies involved in the manufacture of polymer-based nanocomposites for packaging applications, the Best Practice Guide provides practical advice and recommendations which are easy to understand, use and apply in an industrial setting. This includes technical information concerning the specific applications and properties of nanofillers and polymer-based nanocomposites, as well as new scientific knowledge and guidance on environmental, health, and safety issues. recommendations for the safe handling and use of nanofillers and polymer-based nanocomposites, demonstrated using a number of case studies. Further information and contact details are provided within the Mini-Guide on how to obtain the full version of the Best Practice Guide. The research leading to the development of the best practice guide has received funding from the European Union's Seventh Framework Programme (FP7/2007-2013) under Grant Agreement No. 286362 – NanoSafePack. 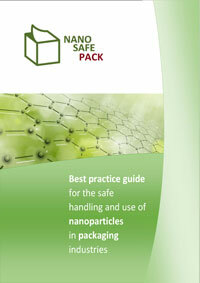 The main aim of the NanoSafePack project was to develop a best practices guide to allow the safe handling and use of nanomaterials in packaging industries, considering integrated strategies to control the exposure to nanoparticles in industrial settings, and provide SMEs with scientific data to minimise and control nanoparticle release and migration from the polymer nanocomposites placed on the market. To achieve this aim, a complete hazard and exposure assessment was conducted to obtain new scientific data about the safety of polymer composites reinforced using nanometer-sized particles. An evaluation of the effectiveness of risk management measures was also undertaken in order to select and design practical and cost effective strategies for implementation in industrial settings. In addition, a life cycle assessment of nanocomposites was performed, by evaluating their impacts during the processes of manufacture, use and disposal. Results of these studies have been used in combination with state-of-the-art knowledge in the field of nanosafety to inform the development of this guide. The NanoSafePack Consortium consists of 7 European organisations, namely: Techni-Plasper, S.L. ; Centro Español de Plásticos (CEP); Associação Portuguesa da Indústria de Plásticos (APIP); European Plastics Converters (EuPC); Instituto Tecnológico del Embalaje, Transporte y Logística (Itene); Institute of Occupational Medicine (IOM); and Tec Star s.r.l.